Hand hygiene relates to the removal of visible soil and the removal or killing of transient microorganisms from the hands. Hand hygiene may be accomplished using an alcohol-based hand rub or soap and running water. This page has information and resources related to hand hygiene. This document was developed to provide best practices for the performance of hand hygiene in health care settings across the continuum of care. This includes, but is not limited to, acute care, complex continuing care, rehabilitation facilities, long-term care homes, chronic care, pre-hospital care and home health care. Just Clean Your Hands (JCYH) program was developed to help reduce health care-associated infections and the spread of infection by providing focused education and tools for promotion, evaluation and auditing to health care providers. Launched by the Ministry of Health and Long-Term Care (MOHLTC) in 2008, the multi-faceted, evidence-based Just Clean Your Hands (JCYH) program was developed to help reduce health care-associated infections and the spread of infection by providing focused education and tools for promoting, evaluating and auditing for health care providers. Documents and resources for hospitals to implement the Just Clean Your Hands program. Documents and resources for long-term care to implement the Just Clean Your Hands program. 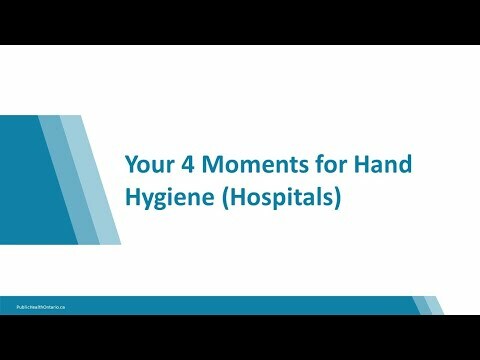 Videos to help you train staff and implement the Just Clean Your Hands program. JCYH step-by-step instructions on how to effectively handrub. Step-by-step demonstration of how to properly hand wash.
JCYH step-by-step instructions on how to effectively handwash. Training for health care providers on the essential moments for hand hygiene. Build on or expand your knowledge in IPAC, including core competencies, environmental cleaning and reprocessing.